PERMISSION REFUSED 8 March 2019. Tandridge District Council has posted this notice on their website. Moorhouse Redland Tile Site – key objection words are ‘severe adverse effect of traffic’; ‘no special circumstances’ in an area of AONB; ‘no sustainability’; ‘inappropriate location’ damage to Westerham’s economy and fabric of ancient buildings – surrounding roads too narrow and not designed for current volume. The veracity and assumptions made in the applicant’s ‘Transport Analysis’ are challengeable. Download key documents from Roxhill/DPD’s Moorhouse website , which gives you access to the Transport Assessment and all its appendices as one file (828 pages), in a format which is easily searchable. Photo of Protest 23rd September 2016 thanks to Neil O’Brien. Planning permission for the first application in 2015 was refused by Tandridge District Council. In July 2016, a second application was submitted. In partnership with the Westerham Society, the Town Partnership hosted a meeting on 29th June 2016 with Roxhill, developers of the site at Moorhouse, DPD , the distribution company, and their planning agent. Moorhouse Redland Tile Site – key planning words are ‘severe adverse effect of traffic’; ‘no special circumstances’ in an area of AONB; ‘no sustainability’ – no transport, and damage to economy and fabric of Westerham Society; ‘inappropriate location’ – surrounding roads too narrow and not designed for volume. The veracity and assumptions made in the Transport Analysis is challenged in many objections. 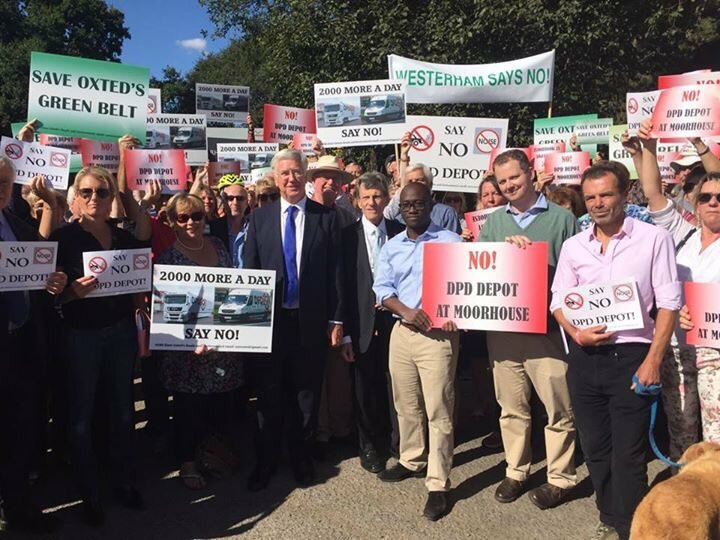 Read Westerham Residents’ Association Objection here; June 2016 Traffic Survey here; Appendix 1 Stoke Geopost/DPD site location here This response analyses and challenges figures in the Traffic Analysis part of the application. These sites, called super-depots, can currently cope with 25,000 parcels a day so it is reasonable to suppose Moorhouse will grow to that size, or bigger. Parcels will arrive at Moorhouse overnight (the developers admit to 33 HGVs) and will come from two hubs in the Midlands, via Jct 6 at Godstone. The delivery vans (LCVs or LGVs) are Transit size and hold on average 100 parcels. They are mostly owner-drivers so you can deduce they will need 250 vans going in and out in the morning and back in and out again late afternoon/evening. Vans collect parcels as well as deliver and take them back to Moorhouse for onward shipment. This equates to 1000 extra LGV vehicle movements a day, mostly at peak periods. The document http://www.visitwesterham.org.uk/wp-content/uploads/2016/07/16318-05c-TA.pdf (which is a searchable pdf copy of the document on the TDC website) shows a new layout for the junction at Moorhouse (see page 103). This shows the road will be widened in front of the Grasshopper Inn so a new sleeper lane can be created for westbound traffic turning right. The same plan shows that the western end of the lay-by will be closed to eastbound traffic. Westbound traffic (inc HGVs) leaving Moorhouse is now shown as exiting from this end of the lay-by. It is not clear from the application whether the lay-by would continue to be available as a pit-stop. See proposed area coverage here. The applicant’s strategy appears to be to create a new super-depot called “Westerham” which will serve a wide range of postcodes shown in the map. It would appear that increased capacity in these areas cannot be handled by existing depots, so there is a plan to offload some of their geographic allocation to “Westerham”. To reach eastern destinations or the A21 to go north towards Bromley or south to Tunbridge Wells, a vast majority of the LGV traffic will have to go through Westerham.